We’ve reported on prototype versions of Campagnolo’s new electronic groupset on pro’s bikes before – even as far back as the 2005 Classics – but this is the first time anyone in the press has actually got their hands on the revolutionary new system. The electronics are in the gear shifting mechanisms. Rather than using steel cables, the bar-mounted shifters use microswitches which operate the electronic derailleurs through small wires linking them together. 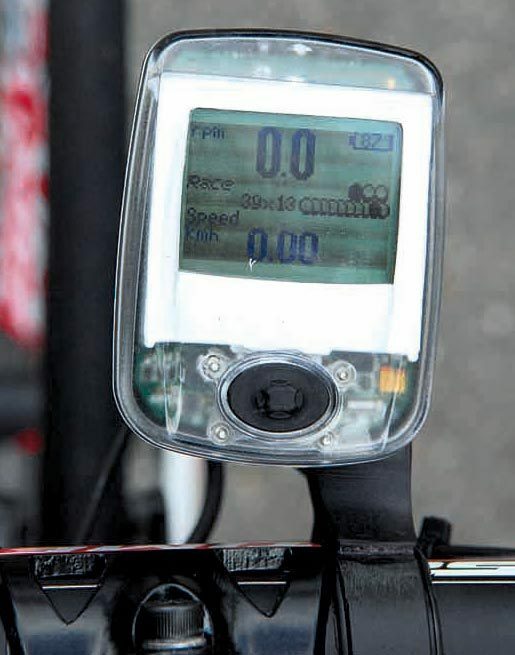 The whole system is powered by a battery integrated within a bottle cage, with a computer on the handlebars and a brain under the bottle cage controlling the whole system. Thanks to the lack of cables, shifting is much lighter than on regular groupsets – this is most noticeable for the front derailleur. Individual changes are made by pushing the lever once, multiple changes can be achieved by holding the lever. Single changes are incredibly smooth both up and down the block, and multiple changes are noticeably quicker. What happens when the chain starts rubbing? 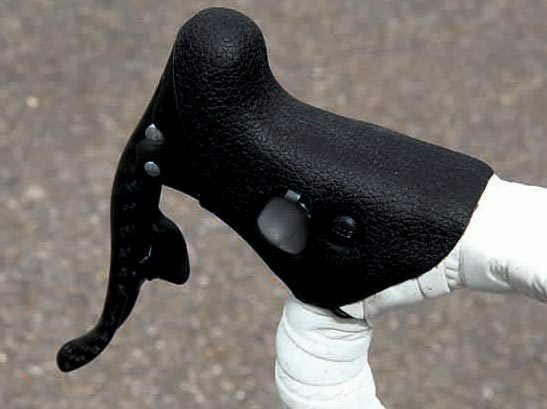 On a conventional system, you would adjust it manually but on Campag’s electronic set-up the computer adjusts the mechs automatically. The system will also detect and recalibrate automatically if a wheel is changed or you change the block. Clever stuff. Initial teething troubles with prototype systems allowing water ingress and transistors shaking lose on rough roads seem to have been ironed out – the initial sets were hand-built, so full production version should not have these issues. The new electronic components have been designed to slot into Campagnolo’s existing Record groupset, and there is no weight penalty between electronic and manual equivalent parts. You can read the full test of the new Campagnolo electronic system in this week’s Cycling Weekly, out on Thursday, September 20.